Welcome to Midway’s bountiful and beautiful Community Garden. Created in 2010 and financed by grants from New Horizons for Seniors, the Community Garden is one-acre in size and totally enclosed by a deer fence. Thirty-five raised wood beds (4’x10′), some of which are senior friendly, and 36 garden plots (10’x20′) comprise half the site and rent for $5/year. The rental fee includes use of water, hoses, sprinklers, garden tools, and compost.  Rentals are handled through the Midway Village Office. The remaining portion of the Community Garden is used for community growing and sales. Potatoes, squash, corn, beans, asparagus, garlic, watermelons, and pumpkins all find their way into the healthy eating habits of many Midway residents. This community garden treasure is located by the Midway Airport hangers and is within walking distance for most residents. There is also a food preparation area where residents are able to dehydrate, can, freeze, or vacuum-seal their produce. When in Midway come and visit us at the garden – you are in for a treat.